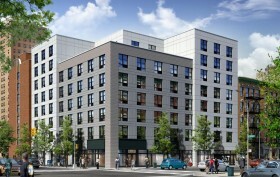 The lottery is open for 53 brand new affordable units at 275 West 140th Street in central Harlem. The building, dubbed Strivers Plaza in reference to its proximity to the nearby historic homes of Striver’s Row, is an eight-story structure designed by affordable housing gurus Aufgang Architects. As previously reported by Yimby, Radson Development was able to build bigger than zoning would normally allow due to the inclusion of the below-market rate units, as well as an 8,000-square foot supermarket in what’s considered a “food desert.” Available units go from $494/month studios to $2,405/month two-bedrooms for people with a wide range of annual earnings — 40 to 165 percent of the area median income.